MANILA, Philippines — The March 2019 Licensure Exam for Teachers (LET) or teachers board exam results including the official list of passers, topnotchers (top 10), top performing schools and performance of schools for Elementary and Secondary levels are released online in May 2019 or within two (2) months after the exam. 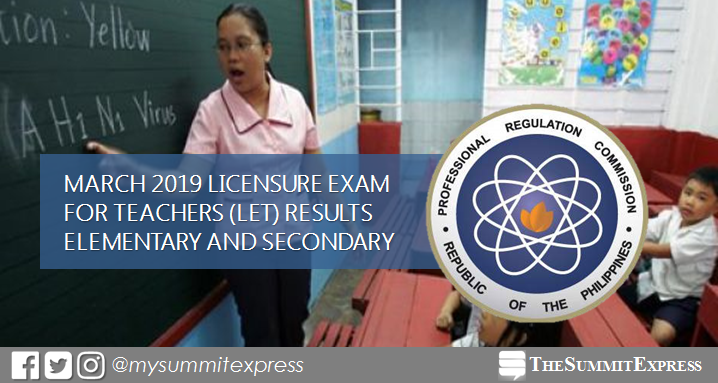 The Professional Regulation Commission (PRC) conducted the first LET board exam this year on Sunday, March 24, 2019 in at least 20 testing centers in the country. Testing centers include Bacolod, Baguio, Cagayan De Oro, Catarman, Cebu, Davao, General Santos, Iloilo, Kidapawan, Legazpi, Lucena, Manila, Pagadian, Pampanga, Romblon, Rosales, Occidental Mindoro, Tacloban, Tuguegarao and Zamboanga. Updating for the official list of passers...check back for results. The schedule for the issuance of Professional Identification Card (ID) and Certificate of Registration for Elementary and Secondary level exams will be announced once results are out online. LET board exam's verification of ratings (passers, non-passers and removal) can be done online. The March 2019 LET covered two (2) parts for Elementary - General Education (40%) and Professional Education (60%) and three (3) parts for Secondary - General Education (20%), Professional Education (40%) and Specialization (40%). In order to pass the recent LET, examinee must obtain an average rating of not less than 75% and must have no rating lower than 50% in any of the tests. Note that passing the teacher licensure exam and having valid professional license from the Commission are necessary before the practice of teaching profession in the Philippines. Otherwise, those who will violate may face fine and imprisonment based on penal provisions. According to PRC Resolution No. 1127, the target release of March 2019 LET board exam results is on Tuesday, May 21 or in 38 working days after the test. PRC Board News, our partner website for PRC board exam results said that the probable release of March 2019 LET exam results is between May 13 and 31 ( 32-46 working days). Note that results may be released earlier or beyond the target without prior notice. This is due to several factors such as the total number of examinees, effect of work cancellations due to calamities and unforeseen events and system of checking the pencil-based tests. In the past six (6) years for the same period, 36 days is the average number of days before the release of results for the average of 102,392 examinees. Average passing rate is 28.46%, 24.43% for Elementary and 31.74% for Secondary. This means that 3 of the 10 examinees usually passed the tests. In the same period last year, results were out in forty (40) working days. A total of 13,774 elementary teachers out of 58,323 examinees (23.62%) and 22,936 secondary teachers out of 76,673 examinees (29.91%) successfully passed the tests. John Michael Tagayon dela Paz of University of the Philippines (UP) - Diliman aced the Elementary level exam with 88.80%. Kier Araula Baugbog from Pamantasan ng Lungsod ng Valenzuela topped the secondary level exam with 92.40%. None of the schools qualified for the top performing school list for Elementary. Meanwhile, UPD led the schools for Secondary. In the March 2017 exam, results were also released in forty (40) working days after the exam. A total of 5,600 elementary teachers out of 53,915 examinees (10.39%) and 18,482 secondary teachers out of 72,584 examinees (25.46%) successfully hurdled the exams. Samantha Christel Chua Gaerlan from De La Salle University (DLSU) - Manila topped the Elementary level exam with 90.60%. University of Mindanao (UM) - Davao City alum Marian Kaye Fortinez Gallego aced the board exam for Secondary level. None of the schools qualified for the top performing school list for Elementary. UPD also topped the schools for Secondary. Same with the previous LET examinations, The Summit Express will provide reliable updates before the release of results. Takers can expect the most probable or exact date of release on this page. Monitor this page for the real-time updates on LET results. Check out also the official website of PRC for more information.